These 18+ events will save you from the dark, rainy and cold days. Laid back beach volleyball tournament will be played in Biitsi’s +26°C heat, and frosty drinks will cool you down while the DJ is playing your favourite tunes. The very first Beach Club Tournament was a huge success in May 2017! Now this event will be held monthly in the Helsinki's or Tallinna's indoor beaches. 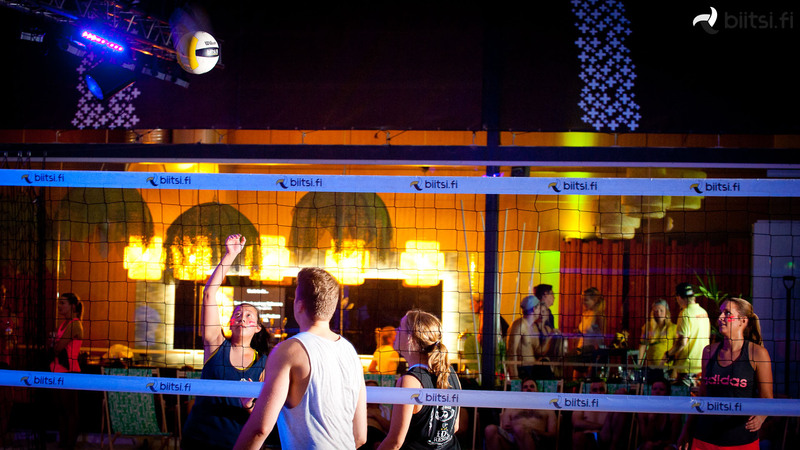 13.4.2019 Beach Club Tournament is the official afterparty of the Finnish volleyball student championships, OSM Games! We sell special OSM tickets for the ones who participate the games. 19:00 - 01:00 Sauna is on! Collect your own 3+ person beach volleyball team, or join an All Stars team by yourself. All Stars team consists of other solo players and staff members. The tournament will be played 4 vs 4. Also 3 is allowed. Your team can be mixed, or it can consist of only ladies or only men. Tournament fee is 100 €/team and All Stars player 25€/person. There will be a House DJ & Host that makes sure beach vibes will continue outside the games too. Fun games will be held in the bar as well. Light snacks are available for everyone! More info from the beach staff and Hanna (hanna.molari@biitsi.fi +35840 745 3808). BEACH CLUB team 100€ Full! BEACH CLUB All Stars -player 25€ Full! OSM All Stars -player 15€ Full!